Arjo Atayde looks forward to playing a politician in his new project. 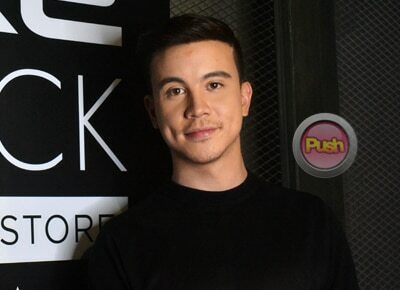 As part of the cast of the online series OTJ Season 1, Arjo Atayde admitted his newest project is a dream come true for him. "When they called me, I was pretty much happy because OTJ is one of my favorite Philippine movies of all time. Movies like OTJ and Honor Thy Father, those are my type of movies and I would love to be in one. It’s really interesting that they turned it into a series and of course it’s an honor. I feel very blessed to be part of this team with a very good cast. I had no idea who i was going to work with and when people started coming in I started getting excited because this is a good cast. At saka happy ako kasi it’s my dream to work with direk Erik Matti eh. It’s finally coming true. I’m very much excited. Super,” he shared. As part of the top rated series Ang Probinsyano, Arjo said he was willing to sacrifice his free time to do OTJ. "Kahit araw araw ako mag-taping basta makatrabaho ko si direk Erik okay lang. Kahit yung weekends ko makuha na that’s fine basta I want to be part of this not only because it’s a good series but also because I appreciate na si direk Erik personally talked to each and every person na gusto niya maging part ng project niya. I appreciated that and I’m happy sa lahat. Sa Ang Probisyano we’re taping almost everyday so I don’t think I have time for workshop pero researching on my own as an actor of course I do. It’s part of work and ini-explain naman ni direk Erik and we talk to him. So so far so good,” he admitted. With his role as a former news anchorman turned congressman, the OTJ: the series actor shared what his biggest challenge will be. "The challenge for every actor is to build a new character even the smallest roles should become believable and I think that’s the hardest part. And of course the character itself. Obviously I’m not a congressman and there’s some researching that I have to do. As far as I’m concerned, every role that’s given especially this one which I never thought of doing is really hard. That’s the challenge for me,” he said. Although he has been known to play the anti-hero, Arjo said he feels glad to finally play the good guy in the new HOOQ Originals series. "Finally hindi ako kontrabida (laughs). It’s a very driven character, generally speaking. Driven siya na tao and ayoko na ikuwento yung iba kasi I don’t want to spoil. But just like Piolo Pascual’s character in the movie, he is driven as well. I’m a news anchor turned congressman kasi he believes that he fits more into politics more than just being a news anchor. Love-hate relationship kami ni Bela Padilla dito. So parang we have a love story going on at the same time two different worlds until love brings them back to the town. The special connection that they have for each other brings them together, Ang romance naman dito hindi naman talaga romance,” he said.